Dejected Dungannon Swifts boss Rodney McAree admitted Curtis Allen was the difference between the sides at the Oval on Saturday. 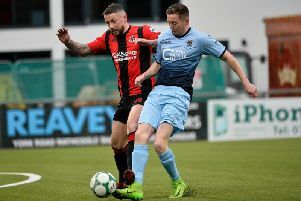 Although Glentoran enjoyed their first Danske Bank Premiership home win of the season, courtesy of goals from Calum Birney and Allen, McAree headed off down Mersey Street frustrated in the sense that he knew it was a big chance lost. He’ll need no reminding of glaring first half chances that went begging, in between those Glentoran goals. And, when Chris Hegarty did finally manage to pull one back four minutes from time, it was always going to be in vain despite the late onslaught. “The difference between is the likes of Curtis Allen,” said McAree. “When he gets half-a-chance, he puts it away – the ball ends up in the back of the net. “It’s what happens in the two 18-yard boxes that counts in football matches. Glentoran got into our box three times in the first half and scored twice. “We got into their area on numerous occasions and we didn’t capitalise. We’ve been decent . . . our build-up place is good, we are nice on the eye, but we have no cutting edge. We just haven’t been good enough in the final third. “But it’s about winning games of football and we need to start capitalising on the chances we get. “Chris’s goal just came too late for us. After we scored we began to panic a bit . . . we began to launch long balls which is no our way of playing. But we kept it going right to the end. McAree admits his boys can’t afford to become too down-hearted as they crave their first win of the season. “You have got to persevere, but you can afford to wait too long and hope things will turn,” he added. “All of a sudden boys’ confidence starts to wane and heads begin to drop. “We need to make sure we get a result as quickly as possible. We have Limavady coming up in the League Cup, but that will not be easy either. We then got to Institute away next Saturday which will be another tough match. Glentoran boss Ronnie McFall insists he’ll be doing all he can this week to strengthen his team before the close of the transfer window. “We have a better shape about us,” he said. “We are still looking to bring in more players, even at this late stage and we’ll be pushing this week to do that. “There is no point kidding ourselves, we need to strengthen the squad. In saying that, I’m pleased with the hunger, commitment and desire of the players. They have bought in to what we are doing, but we are still a work in progress. “The players are giving us everything, so we can’t ask for an awful lot more. We are not getting carried away. We know we need to make additions to the squad, so we’ll be trying to do that this week to push us on even further. GLENTORAN: Morris, Garrett, Kane, Birney, McMahon, Allen (Byrne 92), McGuigan, Davidson (McDaid 67), Kerr, Pepper, Redman. Unused subs: Nelson, Crowe, Gordon, Ferrin, McCarthy. DUNGANNON SWIFFTS: Moore, Hegarty, Wilson (Hutchinson 67), Clucas, McMullan, McElory, Harpur (Campbell 66), O’Rourke, Patton, Burke, Coyle (Lowe 67). Unused subs: Addis, Teggart, Avelino, Smyth.